Your teeth are designed to last a lifetime, but sometimes they don’t! Replacing missing teeth is important to your general health and to the health of your other teeth. Not only do you lose chewing ability when a tooth is lost, but un-replaced teeth can cause other teeth to be lost, tipped or crowded and create subsequent problems. Also, there are obvious problems of poor appearance and loss of self-esteem caused by one or more missing teeth. Dental implants should always be considered as an option to replace a failing or missing tooth. Replacement of lost teeth with dental implants has been used for treating missing teeth for more than 50 years and is recognised as an effective treatment choice. Treatment is considered more predictable than bridgework, resin bonded bridges and endodontic treatment. Dental implants are an excellent solution for the millions of people who have permanently lost a single tooth, many teeth or for those who use dentures. Made of materials that are compatible with human bone and tissue, dental implants provide artificial teeth that look natural and feel secure. They can also be used to attach full or partial dentures. Restoring normal chewing and speaking functions. Increasing your confidence by replacing teeth that won’t move or loosen and have the same look, feel and function of your natural teeth. Eliminating irritated and painful gums, as well as damaging pressure on remaining natural teeth caused by dentures. Helping to stop the progressive bone loss and shrinkage of your jawbone by “mimicking” the roots of natural teeth. A major benefit of dental implants is that they prevent bone loss. As the jawbone requires pressure from chewing in order to maintain its density, it will deteriorate in the absence of a tooth. In fact, in the first year after you lose a tooth, your bone will lose 25% of its volume, and this will continue for as long as the tooth goes un-replaced by an implant. Regular dentures and bridges can actually worsen bone loss because there is nothing to stimulate the bone. On the other hand, implant-supported dentures and bridges act like natural teeth and provide the pressure necessary to maintain bone density. I have a loose denture. Can dental implants help me? Yes they can. Implants are commonly used to replace individual missing teeth but they can also be used to secure or stabilise loose dentures in either the upper or lower jaws. Instead of having a crown (cap) fitted to the top of the implant a precision-made attachment is fitted which inserts into the underneath surface of the denture, securing the denture to the implant. In the lower jaw this can be achieved with as few as two implants. If there is sufficient bone available and you are willing to have more implants inserted then you can often be fitted with a completely solid set of teeth attached to the dental implants (a full-arch bridge). This set of teeth would stay in permanently and would look and feel very similar to a natural set of teeth. Because the implants fuse to the jawbone and offer a secure base for the replacement teeth, some patients find this a comfortable option in restoring their smile. In many cases, implant-retained teeth look and feel more like natural teeth. What are consequences of tooth loss? Throughout the course of life, teeth are lost for many reasons. Missing teeth at the front of your mouth can result in a visible defect affecting the appearance of your smile, your self-confidence and possibly your speech. Missing teeth at the back of your mouth can affect your bite, your face and your ability to eat. 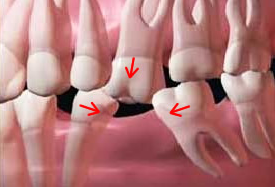 If untreated, missing teeth can cause loss of bone in jaw and can affect position of surrounding teeth. For your unanswered questions please feel free to contact us or book your implant consultation at ‘Edlesborough Dental Practice’.